Bariatric Stainless Steel Washbasin. Unit with 34 inch standard rim height to conform with ANSI, UFAS and ADA Accessibility Standards. Provide integral “D” Shaped basin with an integral, rear overflow. Basin, countertop, backsplash and sidesplash to be constructed of type 304 stainless steel. 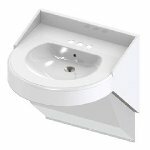 Washbasin shall conform to ANSI Z124.3 and ANSI Z124.6. Trap cover to be constructed of 18 gage, type 304 stainless steel and powder coated white. This item is quick ship based on quantity and inventory. For large quantities please contact a rep so we can check inventory.